- Lou and Doug decide to enter Lou's car into the Variety Club bash. - Hannah worries that her parents might divorce. Helen reassures her, saying that Philip and Julie have come out of rough patches before. - Pam and Doug enthuse about moving to Darwin, and then Pam realises that Cody will be left alone. Rick is rattling around in the kitchen, and Cody can't concentrate on her studies. Rick realises the pressure that Cody is under with the practice exams coming up, and Cody bets that he's glad that he quit school. CODY: It's all just so BORING! This is the time when I'm supposed to be having fun, and I want to go to uni so for the next god knows how many years of my life it's just going to be study, study and more studying! Rick then suggests that they should keep it to the two of them, and then they can do whatever they like. Cody becomes enthused and reckons that they should start to plan straight away but Rick forces her to study instead. Cody is very pleased at the idea that the two of them will get to go away together as a pair. Danni and Sam are talking about Sam building the sets for the school play. Danni comments that Miss Stoner was supposed to be doing the designs, but she's been off due to the shock of finding an octopus in the toilet(!) Sam finds it all highly amusing, but Danni says that she's sorted everything out with Miss Stoner and so she's been doing some designs to help out. Sam teases her about turning over a new leaf! Danni talks about her ideas, and Sam suddenly clicks that Danni isn't doing the designs to turn over a new leaf, or to use up her detention time - it's because Danni's jealous that Lata's got the leading part in the play and she doesn't want Lata to hog all of the glory. Danni thinks that Sam sounds like Brett! After making her promise not to ask for anything too complicated, and feeling that he ought to be nice to her as her birthday is coming up, Sam agrees to let Danni work with him on the sets. He asks her what she wants as a present for her 18th, but Danni isn't bothered. SAM: Don't be dumb! Your 18th birthday is a huge deal - there must be something you want. 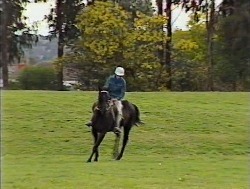 Hannah is riding Painter and Helen watches. Hannah waves happily to Helen. Sam tries to palm off his sandwich on Danni as it was more filling than he thought it would be. He accidentally drops some tomato on Danni's designs. Danni can't believe that he eats so much and stays so skinny. Sam points out that Danni hardly has a weight problem. 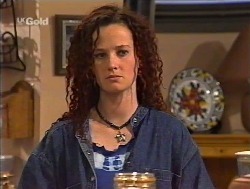 Danni thinks that it doesn't matter if she became grossly overweight because there's no-one around Erinsborough for her to impress. Sam rolls his eyes and tells Danni that Michael isn't the only eligible man in the world. Danni tells him not to start and apparently, he sounds like Cheryl. "There's plenty more fish in the sea, Danielle(!)" Danni remarks that none of them are knocking down her door. Right on cue, there's a knock at the door. DANNI: *My* door, I said - not yours! Sam still finds it funny and says that it could be the man of Danni's dreams. Danni reckons it'll be a complete dork. Sam opens the door. Danni is not impressed! Rick dives straight into Sam's sandwich with enthusiasm. 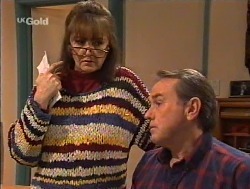 Danni spots Rick's travel brochure and teases him about not having school holidays. Rick points out that by working, he might not get school holidays, but he has dollars instead. This sends Danni into a sulk about not having money for school holidays or a life. RICK: Man, what's her problem? SAM: It's called the Michael Martin blues, mate. RICK: Awww, isn't that sweet! Danni tells him to shut up, as he's got Cody living in the same street as him and threatens to throw the sandwich at him. Sam hustles Rick towards the door. Sam says he hopes that Danni cheers up by her 18th. 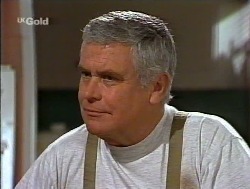 Rick wonders if Michael will make it back to Erinsborough for it, commenting on how far away he now lives. Sam tells Rick that he's a stirrer, especially when Rick suggests that Danni and Michael should join a frequent flyer scheme! Doug is listening to the football on the radio. Pam looks thoughtful. Eventually, she asks Doug if they're doing the right thing regarding Darwin. Doug is dismissive as he's very enthusiastic about going. Pam comments on what a big year it is for Cody. Doug turns the radio off. PAM: We've lived in this area since we were married. It's going to be strange moving somewhere else. Doug realises that Pam's really having second thoughts. Pam thinks that she's getting too old to chase rainbows. Doug tells her that you're never to old to chase rainbows! He says that they're not chasing rainbows anyway, and talks about how they'd be mugs if they let the hotel job opportunity slip through their fingers. Pam still doesn't look convinced. Lou drives up with the HR for the rally. He spots Hannah's clothes and guesses that she'd been horse riding. He tells her that she's as bad as Lauren was when she was a kid. He won't take the tarpaulin off to reveal the car though, as there have been some changes to the sponsors. Helen says that a sneak peak wouldn't hurt, and Lou tells her it wouldn't hurt if people waited a while either! Helen laughs at how seriously Lou's taking it all. She and Hannah leave together, and Cody comes over to Lou. He comments about how much work it's going to be to organise, but he doesn't mind doing it as it should raise a small fortune for the charity. Cody offers to help with the fundraising after she's finished her exams. Lou's pleased at the idea. Lou talks about the various fundraising things that are going on. He says that the raffle tickets are selling well at the Waterhole, and tells Cody that Pam's sending out the Murder Mystery invitations today too. Lou reveals that he's also selling off advertising spots on the car for $500. Lou says that he and Doug want to raise more money than any other team as that way, they've beaten everyone else before the rally starts! They both laugh. Helen offers Hannah a biscuit, but Hannah is really glum. Helen comments that Hannah's so happy when she's on Painter, but a completely different girl when she's away from it. Helen comments that although the pony club situation is a shame, Hannah must get very lonely riding around the paddock by herself. Helen thinks that Hannah needs some other interests with her friends. 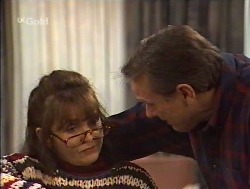 Hannah tells Helen that Philip and Julie reckon it's too expensive. HELEN: It's a lesson we all have to learn, unfortunately, that we can't always get what we want. HANNAH: Ohh, don't say that. Dad sings that to me every time I ask for something! He says it's an old Rolling Stones song or something. HELEN: Is it? Oh, yes, I believe it is. HANNAH: He's not a very good singer, either! Doug and Pam awkwardly broach the subject of Darwin to Cody. Cody is surprised to hear that Pam and Doug are seriously thinking of leaving. Doug says it's the best thing that could ever happen to them. 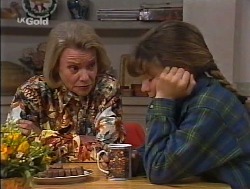 Pam tells Cody that they realise how important the school year is, but things can be worked out. Cody is shocked to hear that it's actually been decided and gets irritated that they didn't ask for her opinion. PAM: Well, you seemed so enthusiastic about the place when Gaby said she was going. CODY: I was enthusiastic for HER! Not for ME! Why would I want to go there? My life is here! My friends are here! My school is here! The places I like to hang out are here! The university I want to get into is here! EVERYTHING! Doug interrupts and tells her that she will meet new people and find new places and universities. Cody is furious. CODY: No, Dad. I'm not finding anything because I'm not going to Darwin! And there's no way you can talk me into it. Upset, she stalks off into the bedrooms. Pam and Doug look shocked. Cody then slams the door, which makes them both jump! Hannah is cleaning her riding boots. Helen returns and Hannah thinks that she didn't take long at the shops. Helen tells her that she lied about going to the shops and went to the pony club instead. She gives Hannah some forms, and apparently, once they're filled in, she'll officially be a member. Hannah is ecstatic and hugs Helen. Cody comes out of her room. 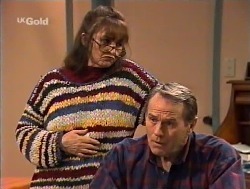 She silently walks over to the kitchen, and then starts ranting about how Pam and Doug are being totally unsupportive. Pam and Doug tell her that they don't intend to go without discussing it with her further, and it'd take weeks for them to arrange anyway. They think that there's plenty of time to really investigate the options regarding Cody's schooling. Pam says that they'll do their best to make the rest of the year go as smoothly as possible. DOUG: If we can do anything, help at all, in any way...all you have to do is tell us. CODY: There is one thing you can do if you really want to help. Pam and Doug both sigh. Cody stalks off outside. DOUG: Maybe we should put her in a box and send her to Darwin as cargo. Danni wants Sam to take a look at her sketches, but he's rushing off for a football training session. Danni is surprised, and Sam says that he got talking to a coach from a local club down at Lassiter's and he was invited to go along. Danni is impressed when she realises that he's trying out for the Emus. Apparently there have been a lot of injuries, so lots of places are up for grabs. Danni thinks that getting an injury doesn't sound too tempting! Danni jumps up and asks if she's got time to go to hers and get a jumper so that she can go with him. Put on the spot, Sam agrees - but only if she hangs up in the grandstand. SAM: Since when have you been so into football? Doug and Lou are having a beer. Lou says that Doug'll love it in Darwin, and the hotel job sounds like a gift. He says that Ramsay Street will miss Doug. Doug tells him that he won't be going for ages. Lou gives him a letter which is about sponsorship for the bash. Doug's pleased and amazed Lou pulled it off. LOU: Well, you know me - gift of the gab! Salesman extraordinaire! Entrepreneur! Tycoon! Danni rushes in to grab a jumper. She tells Lou that she's in a rush because Sam's waiting for her, and Lou starts going on about sponsorship and working on the car. 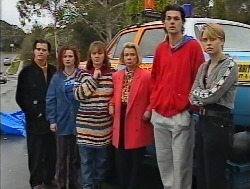 Danni tells them that Sam's trying out for the Emus and Doug and Lou are massively enthusiastic. DOUG: Good man! They're big this year! Lou reckons that he'd like to go and watch Sam try out as well, but he and Doug decide that the car is more important - especially as Lou promised everyone that it'd be ready on time. Danni says that she wants to help out on the car, but she also wants to watch the football. LOU: (mischievously) No, no, never mind. I'll find somebody else. Your brother, maybe. DANNI: Um, er, I'll go and tell Sam that I'm not going. I'll be back in a sec. Danni leaves. Doug thinks he'll grab his tools and join in too, but Lou says that he can wait with everyone else to see the car. Doug concedes and says that he should spend some more time with the family anyway. He admits that the Darwin thing has shaken everyone up. Cody is very upset about Pam and Doug's decision, mostly due to the timing. Rick says that he felt the same when his parents moved to Sydney. Rick points out that he was determined to stay, and he's managed to survive. CODY: Yeah, and look what happened after they left. You went crazy and flunked out. RICK: Yes, but that won't happen to you, Code. You're not a madman like me. Rick tells her to forget about it all and to focus on her studying. He reminds her that she admitted to him that she hadn't studied hard enough for the exams - not if she wanted to get into medicine anyway - so she has to knuckle down. 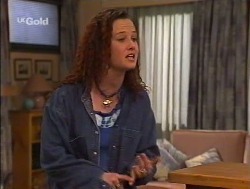 Cody says that she has a horrible feeling that she's going to wreck her whole life, and Pam and Doug aren't helping. Rick tells her that he'll help her, as long as she lets him. Cody jokes that he knows exactly what she shouldn't do(!) Cody decides to do a few hours study. Rick says that she can study at Number 30, where she won't be disturbed, and he'll cook dinner for her. He says he's going to the deli to buy her some smoked cod (and whistles for his keys - I haven't seen one of those beeping key fobs in years). Cody isn't keen as she doesn't like fish, but Rick says that Dave Gottlieb told him it's full of vitamin K and it's the ultimate in brain food. Cody thinks he should buy kilos of the stuff then! He leaves and Cody sighs at her books. Lou and Danni are taking a refreshment break from working on the car. Danni admits that she really likes hanging out with Lou and working on the car. Lou is pleased that she likes cars because he and Cheryl intend to buy her one for her 18th. LOU: Well, it's a bit of a milestone, turning 18 love. It's a time you wave goodbye to your childhood and become an adult. You can vote, fight in the army, drink, drive... Do the last two together, and you can go to jail! He says that they have to do something to mark the occasion, and given Danni's age, it seemed perfect. Danni thinks that it's generous, but says that she feels that she doesn't deserve it. Lou says that they'll make allowances! 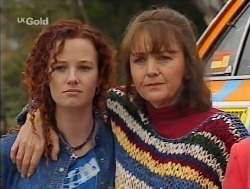 Danni tells him that she doesn't want to seem ungrateful, but she'd prefer a less expensive present instead - a plane ticket to go and visit Michael in South Australia, especially as he can't come back to Erinsborough. Lou isn't sure what Cheryl will think and also suggests that it might be a good idea to check with Michael first. DANNI: Yeah, probably. I don't even know how he feels about me any more. What if he says no? LOU: Of course, he won't! Rick has fed Cody so much fish, she's fit to burst! Rick reassures her about how smart she is, and warns her not to let all of the pressure get to her. Cody wishes that she could talk through the Darwin thing with Pam and Doug so that she can get it off her mind. She decides to bite the bullet and have it out with them. Rick thinks it's a good idea. As Cody goes to leave, Rick tells her that whatever she decides, he'd hate to lose her and tells her that he feels like he just found her. CODY: You know that keyring you've got? The one that beeps every time you whistle for it? CODY: That's like me. Very hard to lose. She leaves. Rick grins. He whistles, and his keyring starts to beep. Cody jumps back around the corner. Rick and Cody both laugh as she leaves. Sam bursts in and tells Lou and Danni that he's been selected to play for the A grade team for the Emus next week. Lou's stunned that he's gone straight in at the top but Sam tells them that he used to play A grade and evidently, he's still pretty fit. Sam is over the moon, as he thought he'd be lucky just to play and would have to work his way up. Lou tells him that he's home just in time for the big unveiling of the car. Doug and Pam are setting the table. Cody apologises when she realises that she didn't tell them that she was eating as Rick's, as Doug went to the market especially to get some fresh fish! Cody explains about that Rick's meal was fish too because of its status as brain food! Doug is pleased that they're all back in speaking terms. Pam tells Cody that they don't want to fight, but she keeps saying how they're not discussing things with her, but she isn't giving them a chance. DOUG: We just want to talk to you. Calmly, that's all. CODY: Yeah, I know. I threw a bit of a tizz. It's hard to keep calm when someone's throwing your life upside down. Cody says that she's going to be under heaps of pressure until the end of the year, and she can't even consider thinking about Darwin at the moment. Pam thinks she's come up with a solution - Doug can go up to Darwin and start everything off, and she'll stay with Cody until the exams are over. Cody is stoked by the idea. They're interrupted by the sound of the HR's horn. They all pile out of the door to look at the car, but the phone goes. Doug grabs it - it's Gaby. Rick emerges from Number 30 as Pam and Cody step outside. Cody tells him that she's staying, and Rick is overjoyed. Danni, Sam, Helen, Pam, Cody and Rick all watch as Lou unveils the car (to a fanfare, no less!). Everyone cheers and claps. Doug comes over, looking glum. Lou calls for him to make a speech, but Doug sadly tells him that there's no point making one - he won't be going on the bash. He tells them about Gaby's phone call, and says that the plans for the hotel have already been approved - far more quickly than he expected - and so, he's needed up in Darwin straight away. Pam and Cody look shocked. 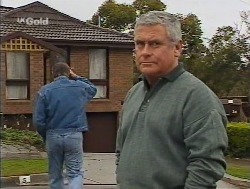 Doug wishes Lou the best and apologises. He hopes that Lou can find a new co-driver. Doug admits that he knew there would be a lot of sacrifices when he took the job in Darwin but he didn't realise this would be one of them. Pam puts her arm around Cody. Sadly, Doug walks back to his house.